Everett in winter as viewed from the Whidden Hospital in 2007. 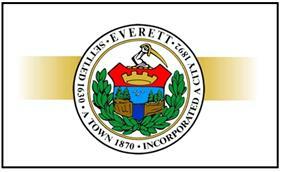 Motto: "City of Pride, Progress, and Possibilities"
Everett is a city in Middlesex County, Massachusetts, United States, near Boston. The population was 41,667 at the time of the 2010 United States Census. Everett is the last city in the United States with a bicameral legislature, which is composed of a seven-member Board of Aldermen and an eighteen-member Common Council. On November 8, 2011, the voters approved a new City Charter that will change the City Council to a unicameral body with eleven members - six ward councilors and five councilors-at-large; an event that provoked an emotional response from many Everett residents. The new City Council will be elected at the 2013 City Election. Everett was originally part of Mayor. 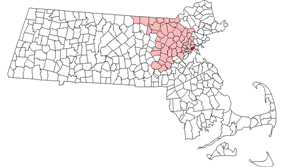 Everett is bordered by Malden on the north, Revere on the east, Chelsea on the southeast, Boston and the Mystic River on the south, and Somerville and Medford on the west. Everett is 4 miles (6.4 km) north of Boston. Glendale Park is the city's largest park. According to the United States Census Bureau, the city has a total area of 3.7 square miles (9.6 km2), of which 3.4 square miles (8.8 km2) is land and 0.3 square miles (0.78 km2) (7.63%) is water. In 2010, 33% of the residents of Everett were born outside the United States. This percentage was around 11% in 1990. 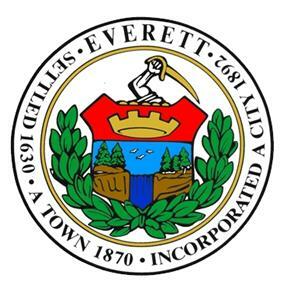 Everett has a mayor-council form of government, where the mayor serves a two-year term. The Everett city council is bicameral, consisting of a Board of Aldermen and a Common Council. As of November 8, 2011, it will become a unicameral City Council. The Board of Aldermen consisted of seven members one from each of the City's six wards and one Alderman-at-Large. All Aldermen were elected city-wide for a term of two years. 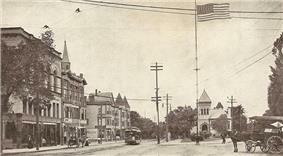 In addition to the duties they shared with the Common Council, the Board of Aldermen was the licensing authority in the City and approved licenses for motor dealers, second-hand dealers, awnings, lodging houses, junk dealers, pool tables, open-air parking lots, coin-operated devices, Lord's Day licenses, antique and precious metal dealers. The Common Council consists three members elected per ward for a total of eighteen members. The Common Council shares equally responsibility for most legislative actions with the exception of licensing and confirmation of most Mayoral appointees. Everett has eight public schools, which include six elementary schools, five middle schools, and one high school, Everett High School. The city also has a number of private schools, including three K-8 schools and one high school, Pope John XXIII High School. Everett High School moved to its new location, at 100 Elm Street, beginning in the 2007-2008 school year. Part of the historic Revere Beach Parkway listed on the National Register of Historic Places, lies in Everett. Also, The Leavitt Corporation has been manufacturing its trademark Teddie Peanut Butter in the city since 1924. Everett is home to the set of the new ABC pilot Boston's Finest. The city was the setting for the 2007 Ben Affleck film Gone Baby Gone. The old Everett High School was used for the filming of scenes for the Adam Sandler movie That's My Boy and the Kevin James movie Here Comes the Boom. ^ "City of EverettMassachusettes". City of Everett. Retrieved October 4, 2012. ^ "City of Everett City Council". City of Everett. Retrieved 2013-07-16. ^ Hogan, Julia Rich. "Town of Everett / 1870-1892". Retrieved September 21, 2012. ^ "City of Everett / 1892-1970". Retrieved September 21, 2012. 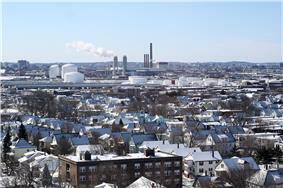 ^ "Profile for Everett, Massachusetts". ^ "1950 Census of Population (Volume 1)". Bureau of the Census. 1952. Section 6, Pages 21-10 and 21-11, Massachusetts Table 6. Population of Counties by Minor Civil Divisions: 1930 to 1950. Retrieved July 12, 2011. ^ "American FactFinder - Results ". Retrieved 20 September 2014. ^ "Everett (city) QuickFacts". United States Census Bureau. Retrieved 2013-07-16. ^ WBUR News & Wire Services (16 September 2014). "Panel Picks Wynn’s Everett Casino Proposal". WBUR. Retrieved 20 September 2014. .1871 Atlas of Massachusetts by Wall & Gray. Map of Massachusetts. Map of Middlesex County. Dutton, E.P. Chart of Boston Harbor and Massachusetts Bay with Map of Adjacent Country. Published 1867. A good map of roads and rail lines around Everett/South Malden. 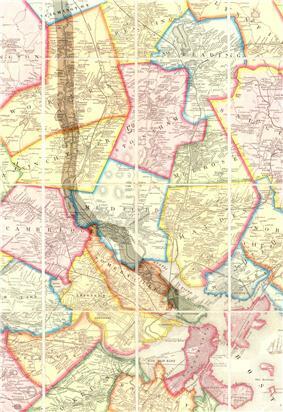 Old USGS maps of Everett. History of Middlesex County, Massachusetts, Volume 1 (A-H), Volume 2 (L-W) compiled by Samuel Adams Drake, published 1879-1880. 572 and 505 pages. Everett article by Dudley P. Bailey in volume 1 pages 428-435. .History of Malden, Massachusetts, 1633-1785The By Deloraine Pendre Corey, published 1898, 870 pages. Note, Everett was originally South Malden. Births, Marriages and Deaths in the Town of Malden, 1649-1850 by Deloraine Pendre Corey, published 1903.